"My heart had not been false and that knowledge was unshakable and scrawled on the secret joints of my soul, like a spell that kept it whole." Proclaiming a book "one of the best of the year" can be a bit dicey, particularly when it's only April and you've got a long way to go until December. Math! I can do it! But I am confident in declaring Roshani Chokshi's The Star-Touched Queen one of the best books of 2016, and one of my favorite romantic YA fantasies ever. It's Hades and Persephone meets Beauty and the Beast meets Indian mythology. Woah. Did you feel that? The shuddering rumble of the Earth shifting under your feet? The poles reversing? The moon turning bright as the sun? People. I have read a book with a romance in it and I LOVED THE BOOK and I would MARRY THIS BOOK and I am starting to wonder what happened to the former me. The me who scoffed at love and at passion and at soulmates. Where did she go? Am I a changeling? Or am I just growing up? I suppose barring the actual existence of fairies, I'm not a changeling, but my tastes are changing and evolving the more that I read and the more that I push myself out of my comfort zone (i.e. epic fantasies, space opera, and British murder mysteries). 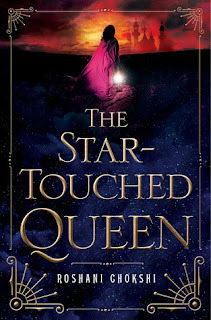 No matter what I write here, I know that I will not do justice to the breathtaking prose and achingly fascinating characters that Roshani Chokshi has created in The Star-Touched Queen. This book will leave you desperate for more. Maya is the daughter of the Raja of Bharata, but she is shunned by her family, especially her father's wives, because of her horoscope: the stars have destined her to be united with death. With a fate like that in a land where horoscopes are taken very seriously, there isn't exactly a horde of eligible young bachelors beating down the gates to the palace to marry her. Maya endures the insults and the hatred by escaping into the rafters of her father's great hall and listening to him conduct statecraft. The only person who truly cares for her is her younger half-sister, Gauri. One day, perched in the rafters, Maya overhears her father decide to marry her off in a political alliance. Any illusions that he cared for her as a daughter and not as a chess piece in the game of war shatter. Her dreams of marrying for love, already fragile as an eggshell, are crushed. 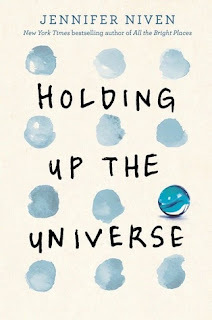 Hoping against hope, Maya wanted so much more for her future: "I wanted a love thick with time, as inscrutable as if a lathe had carved it from night and as familiar as the marrow in my bones." Do you see what I mean about the writing? It's like plush velvet and chocolate mousse and a heady spiced wine all rolled together. Maya's wedding doesn't exactly go as planned. Bharata comes under attack, and a strange Raja appears in the chamber where she must choose her husband. He introduces himself as Amar, the Raja of Akaran. Pressed for time, Maya throws the white garland around Amar's neck, making him her husband, and they escape the bloodshed. After strange encounters in the Night Bazaar, where magical folk ply their wares, and her arrival at an empty palace full of doors and secrets, Maya wonders who, exactly, she married. The insidious, sibilant murmurings that come from one particular door fill Maya's heart with mistrust: is Amar using her? Is he a liar? How many other women has he loved before? What will be done with Maya when he's done with her? Why does he refuse to answer her questions until the new moon? When Maya makes a horrible mistake, she doesn't blame other people or sit frozen with indecision. She acts. She will do whatever it takes to right the wrong she has created. Maya owns her decisions, good and bad, and I loved her for it. With the aid of a demon horse named Kamala, who'd really enjoy a nice toothy bite of Maya's flesh, the new Queen must find her family, find her husband, and find herself. And those may all be the same thing, in the end. Were I to comment on every beautiful turn of phrase in this book, my review would be as long as the book itself. You'll want to bury yourself in the words that Chokshi has woven together into a tapestry that's rich and opulent and dripping with romance. Drink of them, and be intoxicated. 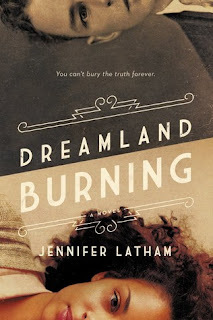 I received an ARC of this title from Netgalley.